Many of us think that our living rooms, even the entirety of our homes, are dull and lifeless. We're told that solid colours are always the best because you can match anything with them. Well the truth of the matter is, the rooms in our homes are like living, breathing entities that are constantly evolving along with their inhabitants. We watch them change over time, as tastes and moods shift, which happens probably more often than we’d like to admit. So are you tired of plain and boring accents in your home? Then you should think about spicing it up, and we here at homify are ready to help you with all the latest in textile trends! The proper execution and use of textiles can really bring any room in your house together and give it the flair it’s so desperately needed and through this Ideabook you'll see that you don’t always have to revamp the entire room to get a new style. A change in textiles works just as well. There are many elements that make up the perfect room for your personal style, but what are they exactly? There are the basics, of course. You need great furniture, accessories, the right lighting, and colour to bring it all together. But there’s one more thing that's missing from many rooms – a secret that all quality designers know that can really transform your space and transport your room to the next level, and that is texture. Of course, everything has a texture. Smooth is a texture. But what we’re talking about when we say texture is incorporating things like wood and textiles — things that have pattern, movement, and are begging to be touched. 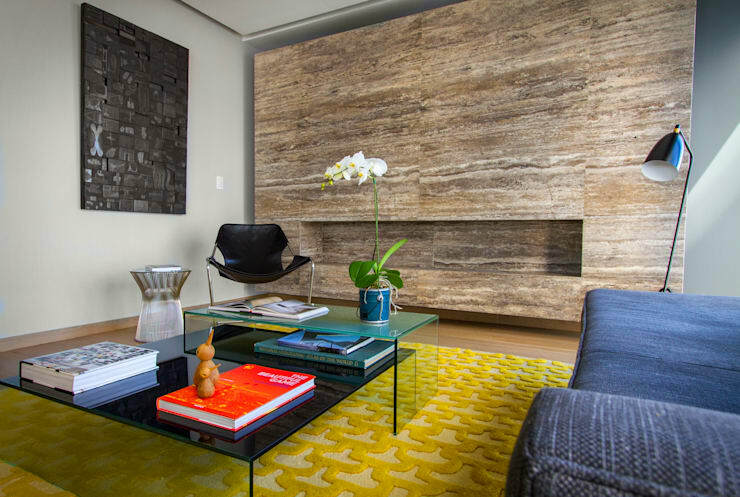 Textures are what make a room feel more dimensional, more cosy, and most importantly, that make it feel complete. Take this area rug, for example. The raised yellow pattern over the beige undertone isn't hugely complicated, but the fact that it's been placed in a rather plain room and assimilated with wooden textures, this carpet allures guests. How about a little animal print? Did you think animal print was out of style? Well, think again. Animal print is back with avengance and you’d be wise to jump on the bandwagon with the rest of the 21st century and get some for your home. 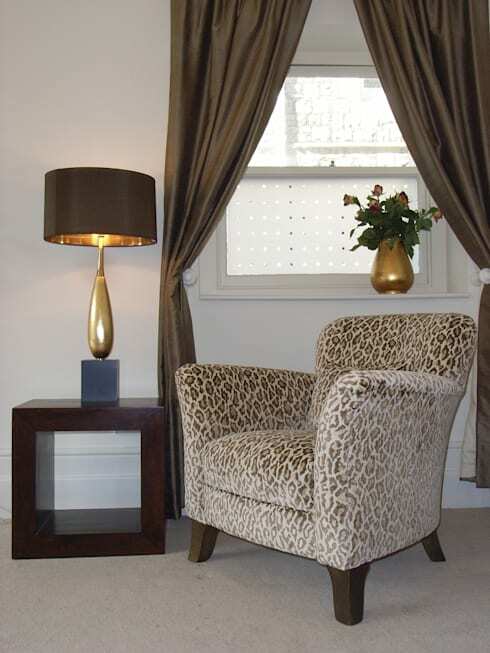 Decorating with animal print can be intimidating because it's so bold, but the key is choosing the right type and the best spot, and then surrounding it with colours that fit your room's design. Realistic animal print usually features neutral or earth tones, but you can find animal prints in daring, vibrant colours that can make a statement. But if you want to stick with the realistic style, don’t be afraid to mix it with bold colours. A red sofa looks chic and modern when paired with leopard or cheetah print. If you like the style, but are worried about adding a bold zebra print sofa or leopard print rug to your space, start small and be subtle and use animal print as a small accent. Ever thought about colour blocking? You've probably heard this term before, but I'm guessing you've heard it when someone was talking about clothing. So what is colour blocking? It's quite simple. Colour blocking is a method of implementing multiple solid colours in your interior space. In a colour blocked room, the room revolves around a palette of two or more colours in bold and bright shades. The result is a very trendy, individual look. Prints and patterns are typically not used in colour blocking, as such designs would take away from the block element. Colour blocking works well with just about any interior. So no worries if your walls are cream-coloured or your floors are pallid — you can take colour blocking to the next level through textiles and accessories. 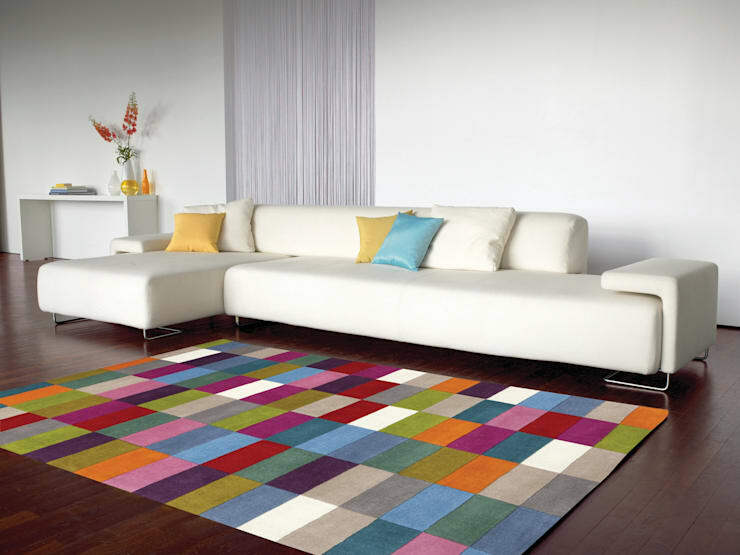 A combination of exciting cushions, for example, or a colour blocked carpet, like we see here. 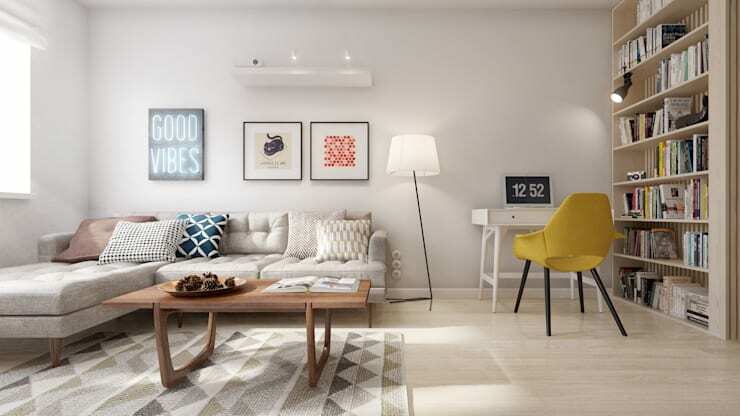 The more off-the-cuff you go with your colour combinations, the cooler these spaces will look! Geometric designs are big news these days. Whether they’re incorporated in patterns on walls, rugs, pillows, or chairs, or have been built into a piece furniture itself, geometric styles are a great way to make any room more prominent and striking. Geometric patterns can be introduced the easiest with textiles. 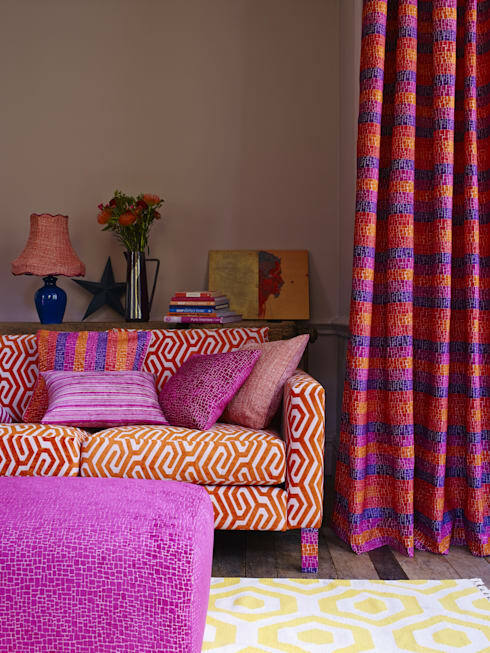 Textiles are versatile, and never more appealing when big, bold, and bright. Geometric design options are virtually endless with the amount of decorating techniques available. Take this living room, for example. The rather plain beige and white colour scheme of the room is amplified by the simple addition of a simple geometrically designed rug and a few pillows. Changing the vibe would also be effortless. Just add bold, colourful geometric patterns where the neutral ones are. And here’s where you can mix and match styles! Colour blocking works exceptionally well when used with geometric shapes – both are daring and they harmonize with each other quite well. Go crazy – mix it up! There's no doubt that solids have their place. And there's also no doubt that interiors are much more fun when we add playful patterns and bold colours that add contrast. Mixing and matching patterns can often be a challenge. It's difficult if you're unsure how to choose the right complimentary colours and scale of patterns to use, but that shouldn't stop you from experimenting! To start off mixing and matching, you can combine a plain background on the walls and floor with patterned furniture, as exemplified here. You can spread matching patterns around the room, or match with the draperies, decorative pillows, or lamps. This technique often combines many patterns in one area, which usually calls for clever mixing and matching of fabrics so they’re unified. Just remember to limit the number of patterns in your room to about three until you’re more familiar with using and mixing patterns. 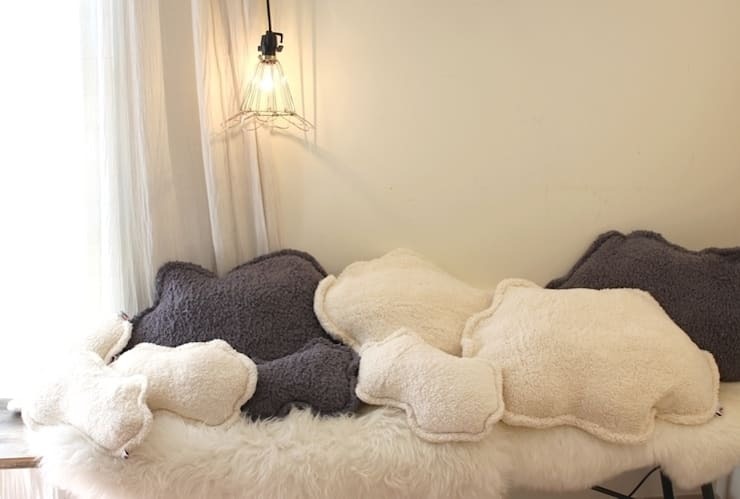 What better way to end this Ideabook than with something warm, fluffy, cozy and fuzzy? Soft and fluffy textiles like pillows and throw blankets will make any living room go from a lackluster room into a wooly paradise. Cloud 9 is not far away with this design choice. Take these pillows and this fuzzy throw blanket in this image here, for example. They look just like clouds, right? Not only do these fluffy little guys provide the aesthetic look of clouds, but you’ll feel like you’re floating on one as well! The soft texture and airy disposition of these pillows will almost instantly make you fall asleep, so watch out. Sticking with plain colours isn't even a necessity here. You could try a vivid blue or purple for an equally cosy feel, but with added pinache. Are you inspired by these latest textile trends? We'd love to hear from you in the comments section below!